This entry was posted in Miscellaneous on April 4, 2014 . Staying at your desk in front of your computer at some point may seem relaxing as you have so many options for leisure, but what about when your “job” is to stay at your PC for numerous hours each day to create, let’s say, web applications, web design, develop e-commerce portals, or do websites for a living? The answer, in our opinion, should be said with loud voice, as the alternative is not so pleasant. We are going to turn the table a little bit and consider that before helping others, is important to help yourself. Why I am saying that? Due to our jobs, we tend to develop some online obsessions and at some point even related habits that unknowingly might affect our personal health in ways that might not at first be obvious or reach the point where some alarms are triggered. First, help yourself before being able to help others, whether is your client, your web app user, or fellow programmer. Do not raise your eyebrow yet, interesting things are just about to flow. After long hours of sitting down, most of you guys tend to hunch over your desk, or slide beneath it or in generally exhibit very poor postures leading to back pain and great discomfort. If you are programming with incorrect postures for extended periods of time, down the road you will have problems for sure. So besides adjusting your chair you should consider other options, as problems can go far beyond simple stiffness and back pain. Calorie burning drops dramatically, enzymes that help break down fat drop 90%, electrical activity in the muscles shuts off all that happening as soon as you sit. 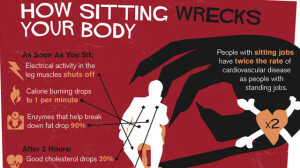 What you should do if your job implies a sitting activity, and still avoid the risks presented above! Take breaks from sitting and move or exercise a bit. If I were to make a list of what is to be avoided probably fast food and junk food would come up ranked very high. When you are stuck in your office more than eight hours a day or even if you are working from your home office, fast food consumption can easily become a way of life. Web developers, programmers who are working full time and also bloggers or freelancers can easily fall into this trap as most fast food barely can qualify as food at all. This type of food is filled with additives and chemicals most of the time is over-processed and hardly has nutritional value. The effect of long term junk food consumption is very concerning, leading to diabetes, obesity, cancer and increases depression rates dramatically. It’s a proven fact that we tend to drink sodas and energy drinks for an extra boost of energy whenever fatigue installs, not to mention that many office workers are highly dependent on coffee and sugary sodas which cause serious health problems. Even vitamin drinks are not what we might think of them, check here other information and then come to senses. Staying indoor for a majority of the working week surely leads to a decrease in Vitamin D level. Achieve a healthy level of Vitamin D with some simple sun exposure each day, but this may be tricky especially in winter time, or simply by not leaving your office during busy working hours. It has been proven that proper vitamin D levels bring countless health benefits such as fighting common cold, depression, and even cancer, so it is recommended to use some vitamin D supplements. Due to this type of indoor working, being stuck to a chair for long hours with constant overtime caused by tight schedules and impatient clients, living a natural life may be quite a challenge. Just put more effort in decreasing your artificial dependencies and increase the level of physical exercises and in other words staying in shape. We advise daily walks or regular exercises, home made food consumption, avoiding sugary sodas, coffee and artificial energy drinks. Train your body, not just your mind and increase the chance of having a long and healthy life and continue to be part of this successfully community of developers and programmers.